Who would have thought that Liam Neeson would be the last man standing? Predictable from the very beginning, this film lacks plot, action and character development. The main problem with this movie is that it is trying to be something that it is not: an intelligent, emotional drama, when really Joe Carnahan just needs to accept the fact that he is directing an action film. That is, an action film with very little action. Between the arguments over who is to lead (Neeson, obviously), the men are picked off one by one by a group of CGI wolves in an entirely predictable and unsurprising fashion. As each man is killed off, I found myself bored waiting for the inevitable: the final showdown between Neeson and the alpha male. Bus alas, the result is utter disappointment, as the film shows us nothing more than the trailer. The end battle, which could have been a CGI masterpiece, as the scenery of the film is actually quite stunning, is omitted. This was a fatal error on the part of Carnahan, as he totally fails to utilise the obvious: the juxtaposition between the two pack leaders could have resulted in a brilliant showdown, but instead, the film fails to deliver on intelligence or action, totally alienating the expectant audience. Full of ‘profound’ silences and ’emotional’ monologues, Carnahan attempts to give each character a back story and personality for the audience to relate to, but these attempts are futile, failing to evoke sympathy from an entirely disinterested audience. Poorly scripted, the actors had very little to work with, leaving an action-less action movie with very little else to entertain. All in all, those were 117 minutes of my life that I will never get back, and Neeson has some serious damage control to do. 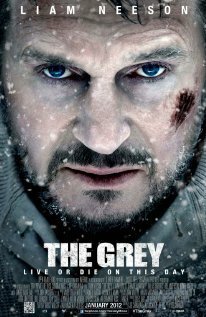 This entry was posted in Reviews and tagged action movie, cinema, film, Joe Carnahan, Liam Neeson, movie, The Grey. Bookmark the permalink.